In the first part of this trip into the Overground’s future, we spent a considerable amount of time in the past (you can find that article here). Doing so may on the surface have seemed counter-intuitive, but it was necessary. This is because the future of the Overground falls largely into to parts – parts which might possibly be described as the “direct” and the “indirect.” The “direct” is the improvements which need to be made to the existing orbital network. The “indirect” is a more intangible beast – it’s the nature of TfL’s relationship with the existing Franchise system and how its role may develop. To a certain extent, these two parts overlap. For the sake of clarity, however, it is probably best to try and tackle them in turn. 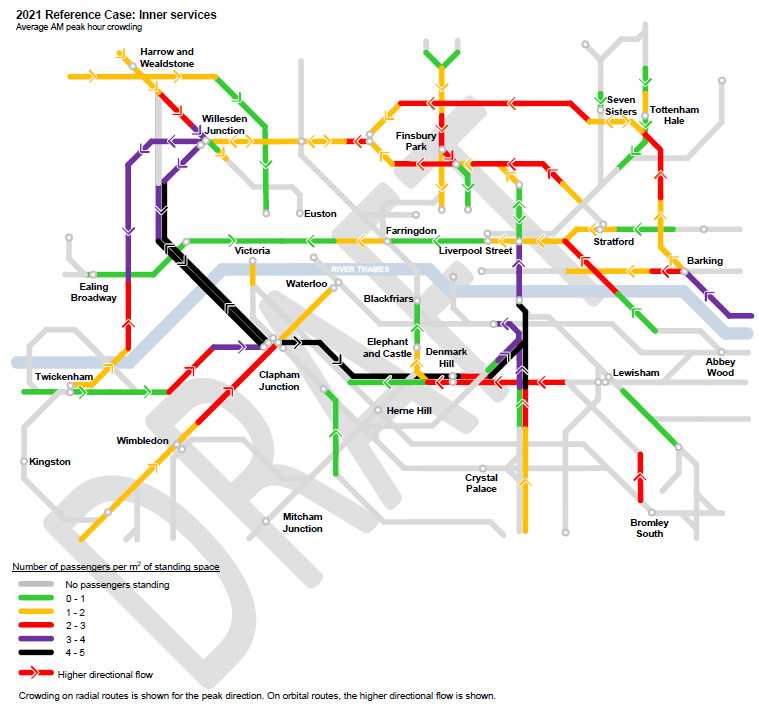 Here in Part 2, therefore, we will looking at what challenges face the existing Overground network and, based on TfL’s HLOS2 response and feedback from various other sources, what plans we may see in place to deal with them. 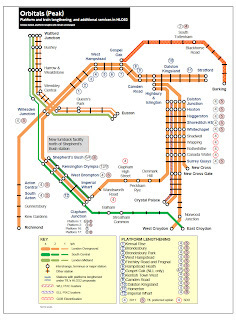 As early as 2005 – before the Overground had even effectively been born – it had been established that the collection of lines we now know of as the London Overground would face capacity issues even were frequencies to be improved and trains lengthened. As it stands now this continues to be the case. 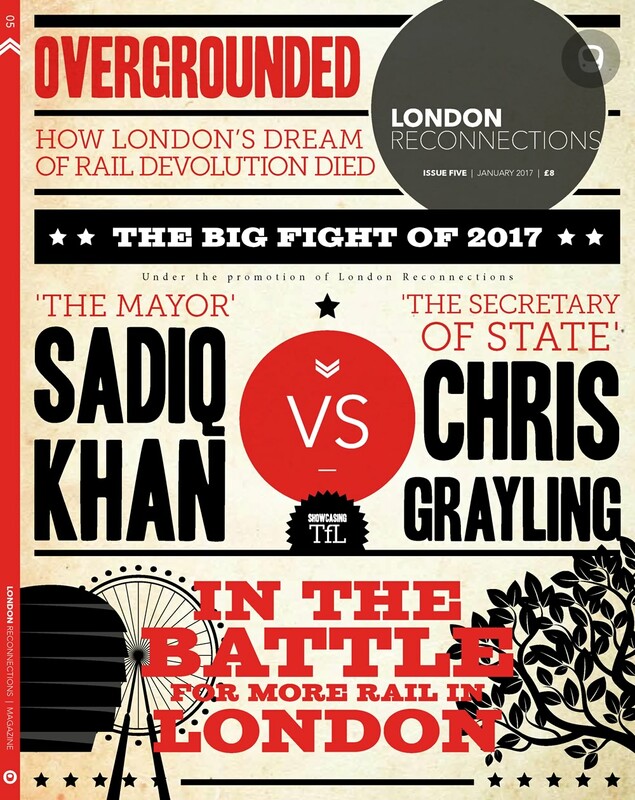 Although line capacity across the Overground has risen, so has demand – and indeed continues to do so. Rightly, therefore, TfL’s HLOS2 response puts capacity issues at the top of the table in terms of risks for the near future. Put simply, morning peak demand is predicted to grow by 60% to 2031, but committed-to schemes will only see capacity rise by 35% without any further interventions. 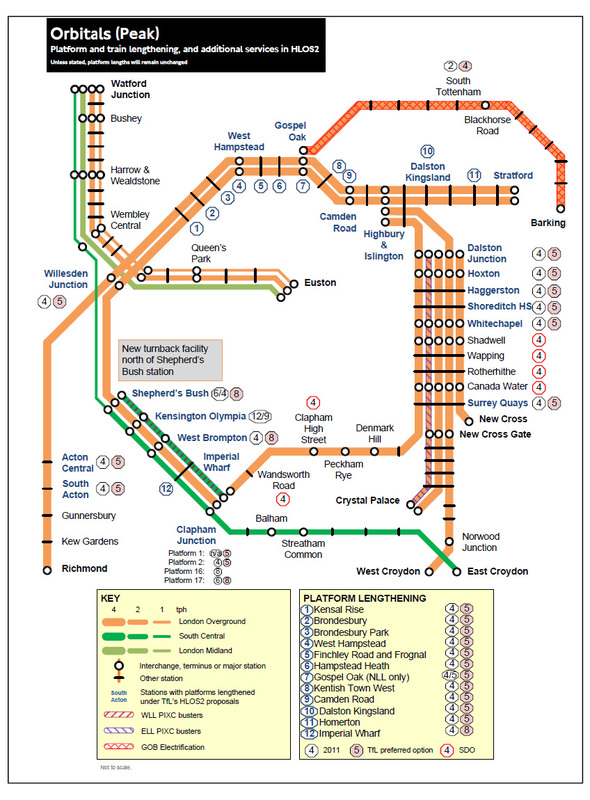 When the predicted passenger numbers are communicated visually, it is easy to see the scale of the problem for the Overground. The graphic below shows predicted number of passengers per square metre in 2021, black being the most dense (a Silverlinkesque 4-5 men-per-metre), green the least. As can be seen it is the WLL and ELL that fare worst, but the NLL has its share of problems as well – especially beyond Willesden. In light of the above, lengthening trains is, to put it bluntly, pretty much essential and unsurprisingly this sits high on TfL’s list of priorities for the next control period. The 4-car 378s currently used across the WLL, NLL and ELL are all designed to take an additional car, and the current proposal is that they should all be lengthened and, on the WLL and ELL, augmented with extra services – an extra 2tph from Clapham Junction to Shepherds Bush all day operated by Southern on the WLL, and an extra 2tph during the peaks on the ELL. Lengthening the 378s obviously has knock-on effects, but the signalling work now completed on the NLL at least means it is now possible. Depot improvements will be needed and signal sitings reconsidered, but the major expense lies in platform extension work. A total of 14 stations will need to have platforms extended on the WLL and NLL and 6 stations on the ELL. Sadly SDO will be required at a number of ELL stations, thanks to design issues for which the Victorians can probably be forgiven (notably Wapping and Rotherhithe) but for which the builders of the JLE most certainly can’t (Canada Water). Precisely which stations will require lengthening or SDO is perhaps better visualised than listed, and the graphic below does exactly that. Sharp eyes will have have spotted another proposal on that diagram. One which has been advocated by many on both this site and elsewhere before – the Electrification of the GOBLIN. GOBLIN Electrification is long overdue. It’s a small scheme that has long sat too low in the priority scale. Its various benefits may all seem small-scale when taken individually and weighed up against other alternatives, but as a package it just reeks of common sense. In capacity terms, GOBLIN electrification would allow, under TfL’s current proposals, a 4-car electric service on that line. The benefits, however, would extend well beyond that, notably into one other area that TfL have identified as being a major barrier to future expansion of both NLL and GOBLIN – freight. London currently sees a large volume of rail freight movements. 10% of all rail freight moved through the UK travels via London, with only 3% of that actually intended for London itself (mainly aggregates for construction). Most of that traffic comes from the deep water ports and the Channel tunnel, to which will be added the London Gateway in the not-too-distant future. On top of this, container traffic is increasing, especially in the 9 feet 6 inch tall containers that have been rapidly cementing themselves as the new international standard (they’re more efficient in shipping terms). Here, its the London and South East RUS that provides us with figures on the likely increase in required daily freight trains for the ports in the coming years – Felixstowe/Bathside Bay is likely to go from 28 trains each way in 2010 to 58 in 2030. Tilbury/London Gateway is predicted to go from 8 trains to a mammoth 50 (reflecting the new DP-World port and logistics centre coming online). Finally, Kent Thamesside is likely to go from 9 paths to 24. Taken alongside the predicted increase in Channel Tunnel freight trains from 6 to 35, its easy to see why moving freight away from the NLL is so crucial. Freight trains are slow and long. They require signal spacing not optimised for metro services, and they block junctions. Without heading too heavily into detail (for that, see Mwmbwls previous assessment of the issue here), the GOBLIN links directly to the Tilbury loop via a set of graded under and overpasses built for the earlier 1955 British Railways modernisation scheme that resulted in the electrification of the London Tilbury and Southend Lines. GOBLIN electrification will thus help mitigate the above freight increases as it allows some freight to be diverted away from the NLL. Between the need to divert freight, therefore, and the need to increase capacity on the line, it appears that the case for de-nobblin’ the GOBLIN may finally have reached the financial tipping point. Beyond issues of train-lengthening and paths, there are few major plans explicitly highlighted for the existing Orbital in TfL’s HLOS2 response or elsewhere. 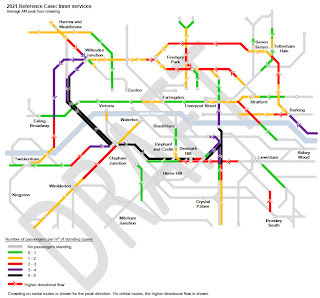 Several station upgrades are, however, currently recommended in order to mitigate foreseen congestion – notably at Barking and Clapham Junction. Similarly, TfL’s HLOS2 response recommends the restoration of the link between Hackney Downs and Hackney Central station. Beyond this, the Orbital projects we are likely to see in the near future move beyond those that are currently recommended and into those which are currently merely suggested or unfunded. Reopening the Crystal Palace ticket hall falls into this category and sources suggest that the restoration of the old Hackney Central ticket hall now does as well – although that is a project which currently falls very much into the area of “funds and logistics allowing.” Finally, moving the 378 current transition point to Shepherd’s Bush and adding a turnback facility is another project that features on the “possibility” list. Outside of TfL, the success of the Overground will likely see more calls for the reinstatement of old stations resurface. Primrose Hill disappeared almost completely at track level at the end of 2008, but rumblings in the local community about reopening it have begun to gain traction once again. It would be no surprise if questions over its viability began to surface in Mayor’s Question Time and beyond in the coming years – particularly if a shift in Freight away from the NLL occurred. Similarly on the WLL, sources suggest that some elements of Kensington and Chelsea Council may push for the case for the old station at St Quintin Park & Wormwood Scrubs to be reopened. Reopening old stations (or adding brand new ones) seems unlikely, given the capacity issues above, but TfL have stressed that such proposals will not be dismissed out of hand – with the right champion and the right finance, it is not entirely outside the realms of possibility that we will see further new stations on the Overground in the coming years. In conclusion, therefore, it is clear that in “direct” terms the Overground’s journey is far from complete. Its rolling stock is better, its infrastructure much improved. There are still, however, significant challenges yet to come – most notably around capacity. It is on these that TfL now appears to be focused. Indeed if the level of service that Overground passengers have now become used to is to be even simply maintained, capacity improvements are not merely optional, they are in fact compulsory.